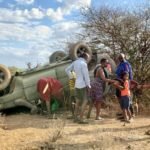 Human rights activist Boniface Mwangi is one happy and lucky man after his family escape unhurt following an accident a long the Namanga-Amboseli road at Lorubuko on Sunday. Mwangi was traveling with his wife and three children when their car skidded on loose gravel before losing control and flipping over. The family was injured at all thanks to their seat belts. “We had passed some men grazing, slowed down, said Hello & then drove on, a few minutes later they heard kids screaming. They rushed to the scene and found us shaken but okay. “When all that very scary experience stopped, all five of us were still belted and in our seats, upside down. Safety belts are lifesavers. Belt up,” wrote Mwangi. Gratitude Mwangi thanked Amboseli Serena Lodge for swiftly responding and sending a vehicle to rescue them and also slaughtered a goat at the scene to thank the Maasai morans who rushed to their rescue. “Slaughtered a thank you goat for Sakita, Ngaiyai & co who came to our rescue. They found us outside the car and stared in disbelief, and then said Enkai (God) saved you. Told us we go, Maasais are good people and the car will be safe, lions and elephants don’t eat or steal cars.” he said. The post Boniface Mwangi slaughters goat at accident scene after escaping unhurt (photos) appeared first on Ghafla! Kenya. Next Post: 1, 2 get a tako… Is this new Kenyan song creative or complete garbage?